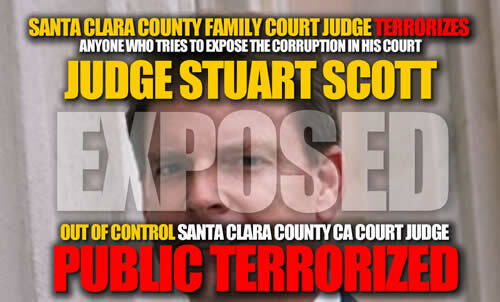 Santa Clara County Family Court Judge Stuart Jeremiah Scott sends Santa Clara County Depuites to harrass and terrorize victims if they speak out about the dishonesty and crimes committed by Judge Stuart Scott in Santa Clara County Superior Court. ​As California’s Commission on Judicial Performance closed in on one corrupt judge, the judge hung himself in the small town of Colusa, California. James Towery was tossed out of California’s State Bar as his legal career peaked in a cesspool of allegations related to misconduct and cronyism, conduct the State Bar is still trying to cleanse. Unwelcome at the Bar, Towery landed in Santa Clara Superior Court, smack on the family law bench. Since that time he has been imposing misconduct on family law cases such that some family lawyers in Santa Clara openly refuse to appear before Judge James Towery, and refuse to accept clients assigned to Towery in their divorce cases. Towery’s conduct on the family law bench continues to draw allegations of ethics violations, mismanagement of court staff, misuse of public funds, wasted resources and cronyism known as“HomeTowning”. Lawyers who benefit from Towery’s hometowning misconduct clamor to get cases heard before Towery. Some of Towery’s staff have been so alarmed by the judges conduct, they have joined the whistleblowers deepinside the Sunnyvale courthouse, in an effort to try to help Towery’s victims. ings to Stewart regarding “HomeTowning “ with nefarious family lawyer, Brad Baugh, were ignored. The state’s judicial watchdog agency has publicly reprimanded a Santa Clara County judge for engaging in private conversation with a prosecutor while sentencing was still pending in a misdemeanor case he had just heard. The Commission on Judicial Performance found that by engaging in the conversation, Judge Stuart Scott violated a fundamental principle of California’s judicial code of ethics: For fairness sake, judges are not allowed to talk privately about pending cases with either of the parties. The commission also concluded that Scott undermined the integrity of the judiciary and the fair administration of justice. As a former deputy district attorney, Judge Stuart J Scott regularly argued facts that weren’t true in jury trials, labeled “pure fiction” by an appeals court. He had cases overturned by the feds in the Ninth Circuit and we the taxpayers paid for his deceit. As a judge, he unconstitutionally ordered a deputy district attorney into his chambers to conspire with her on how to obtain guilty verdicts against the Public Defender’s Office using his methods. His parting words to her were “This conversation never happened”, see http://cjp.ca.gov (under “Public Discipline & Decisions”, Judge Stuart J Scott). She disobeyed him, reporting him to her District Attorney who informed the Public Defender’s office who boycotted him and reported him to the Commission on Judicial Performance, charlene.drummer@cjp.ca.gov. The CJP publicly stated that Judge Scott violated Judicial Canon 2A, basically a fundamental fairness rule to hear both side before making a decision which did nothing to curb his behavior. Why even allow a defendant to have a trial anymore? He was eventually, unbelievably, reassigned to Family Court, now even more incapable of conducting a fair trial. He has little knowledge of the family court laws, accepts attorney’s accusations as facts, defending parents as guilty, and promotes conflict with prolonged custody battles between parents where the only winners are these same attorneys and the true victims are children. He has now violated Judicial Canon 3B, basically a fundamental fairness rule that states when a judge admits to being biased against a parent he must recuse himself. We the taxpayers are now paying for his lack of ethics in the Family Court.